Also available as a portable application. Sometimes we get lucky when we go in search of a featured freeware program for our newsletters. We find something that almost everyone could use. And when we tested it and found it installed no toolbars or other malware (as of 2/13/2014) we were thrilled. We’re old and it does not take much to thrill us! We figure, by now, about 50% of you have paid attention to us and have installed a download manager. And if you’ve listened to us, you’ve installed one you can access with a master password and made backups of your password data and/or use a password manager which stores your passwords, encrypted, in the cloud. So that leaves the other 50% of you – who are never going to install a password manager even if EB twists your arm into a pretzel. But whether do listen to us or don’t listen to us, our freeware pick this week is something every one of you could use. 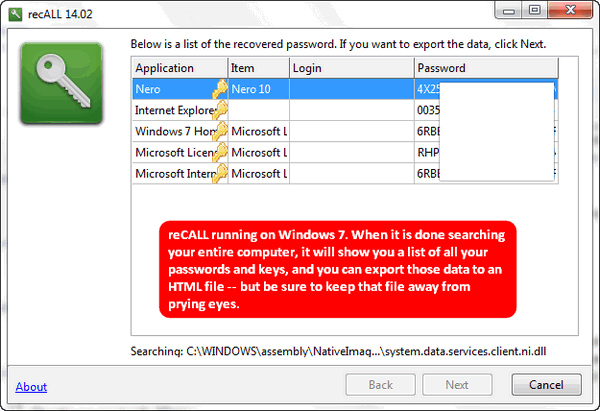 It not only finds your Windows and Office product keys, it finds license keys for over 700 applications. And it also can ferret out your email passwords too — and we know remember email passwords is a problem for many of you. It takes a while for reCALL to scan your computer for product keys and passwords, because it digs deep and finds most all of them. You can also run reCALL in a special mode to just recover your email passwords, if that’s what you’re after. And when you’re all done, you can export the data to a file — but remember anyone who finds that file and can read, will have all your passwords and products keys too. Keep in mind the web site is written in Czechoslovakian or some language I don’t read, speak or write. But check out the image below. 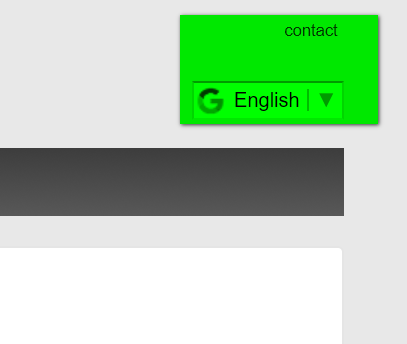 You an select English or whatever your language is by clicking the word near the top right of the web site which is a foreign word meaning contact (really). Click it and you’ll see a list of 500 languages (well, not quite that many, but many). Choose your language from that list and you’re off the races — or at least off to being able to read the page. Recall allows quick recovery of passwords from more than 160 programs (email, web browsers, instant messengers, FTP clients, wireless, etc) and license keys from nearly 800 applications. reCALL The world’s first program that allows you to recover most of the password and also a license from damaged operating systems through native support of the systems registry files. Due to the unique function emulation FTP, POP3 and SMTP can recover passwords from any application supporting these protocols, even if the program is not yet supported in reCALL. All functions in one program. OK if you’re ready to download a really useful program, that as of this date is true freeware, please visit http://keit.co/p/recall/ to learn more about and or download. I downloded and installed the recall program but I dont see how to get passwords or anything else form it. If i click on an item it just says its saved. so what? where? what do I do with it? Application restores passwords saved in your computer (Internet Explorer, Chrome forms and 200+). If its not saved, you cannot recover it. If you use master password in i.e. Firefox, there is not possible to recover password. This software was created to do security audits of operating systems. If you don’t see any password, it’s good for you. You’re safe because no one else sees them on your computer. I just tried to install ‘reCall’, and the link appears to go to a mobile version. I clicked to install anyway, and Windows blocked it because of possible malicious intent. I went ahead anyway, and Emsisoft came on and told me that it had detected and quarantined a trojan. Needless to say, the install was incomplete and I cannot locate a working shortcut to run it. Any answers? Please don’t use a Microsoft browser like Edge or Internet Explorer, or you’ll get the silly warning that the file is dangerous because it’s not popular – not “frequently” downloaded. How many of us were not popular in high school? Did that make us dangerous. Use Firefox or Chrome to download it.